This airport has been extended and reformed in recent years and in 2005 just under 600,000 people passed through its doors. 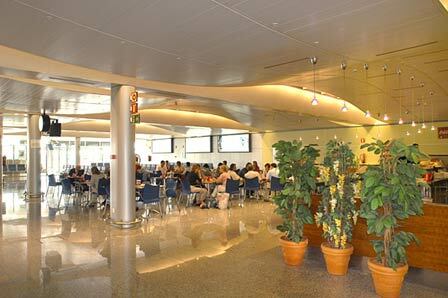 Although this number of passenegrs is a lot less than many other Spanish Airports it is a lot higher than the 180,000 people who passed through the airport in 1995. 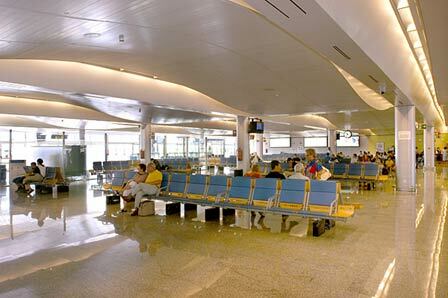 The Santander arrivals and departures area are not that large and there are just 2 baggage collection carousels, 8 check in desks and 3 boarding gates. There is also a multi shop within the terminal building selling cigarettes, newspapers etc and a cafe serving snacks and drinks throughout the day. Parking at Santander airport is free and there are currrently 508 parking spaces. The Santander airport bus stop is just outside the main terminal building and the buses run into Santander every 30 minutes from 0630 - 2245. The airport is only 5 kms from Santander so the journey is quick and costs just €1.50. 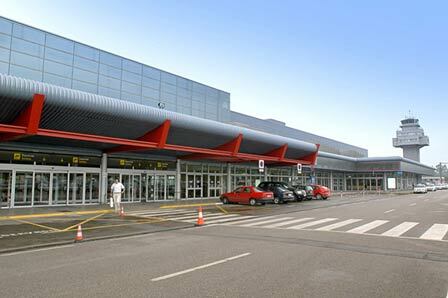 The main taxis at Santander airport can be found on a rank opposite the arrivals terminal. The taxi drivers know when the planes are scheduled to arrive and they are always the waiting. Expect to pay about €15 for a taxi ride into Santander. Santander held its first air show in 1910. The land used as an airfield - situated to the west of La Albericia – gradually gave rise to the city's first airdrome: in 1912, two hangars were installed and the airfield was levelled; in 1913, the Santander Flying Club was set up; Aeronautical Weeks were started, etc. Years after, for several months in 1921, Santander was linked by air to Bilbao and Bayonne via the Network of Seaplanes of the Bay of Biscay belonging to the Franco-Bilbao Aeronautical Transport Company. To enable these operations to be carried out, Santander bay was equipped for seaplanes and given customs facilities. La Albericia continued operating, but in 1936 and 1937 had to share with a new airdrome called Pontejos or Rubayo, set up to the east of the bay. After the civil war, La Albericia shared the scant civil traffic with the military base installed there. In 1948, it was officially opened to domestic civil and international tourist traffic, and technical stopovers. In July 1950, the airline Iberia inaugurated the route with Madrid. However, owing to the limitations of La Albericia, from 1945 it was thought a new airport should be constructed. After different studies, land in Parayas was chosen, in the municipal district of Maliaño, four kilometres to the south of the city, at the far end of the bay near the de Raos marshes. 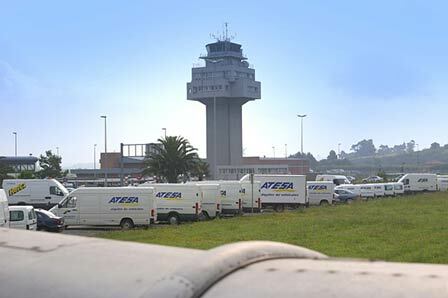 The new airport was inaugurated on 25 September 1953 and, that same day, La Albericia was finally closed. Parayas had a paved runway 1,150 metres long by 70 metres wide, a small terminal building, airport offices, customs and control tower. In December 1959, the tide broke through the dike that closed off the marshes, and the waters of the Bay of Biscay flooded the runway and the airport buildings. The airport was severely damaged. Over the next few years, a new dike had to be built that would hold back the sea. In 1965, Parayas became officially known as Santander Airport and, in 1967, a branch of the Air Rescue Service was set up there. However, the airport became too small and, in 1973, it was decided that extensive remodelling should be carried out. The runway was lengthened to 2,400 metres and a new terminal building, a transmission centre, a fire building, a power plant and a new control tower were constructed. The work was completed in 1976 with the runway lighting, the parking platform lighting, a helicopter hangar, the water treatment plant and the installation of an OM radiobeacon. The refurbished airport was reopened on 8 August 1977. CAUTION Pwr line 230' 1.7 NM fr thld Rwy 11. Bird haz.